After Snap-on allegedly stiffed him out of a mounting number of warranty claims and eventually refused to renew his franchise agreement, King Regian did the previously unthinkable. After 23 years as a Snap-on loyalist, King Regian became the competition: A Cornwell Tool Dealer. 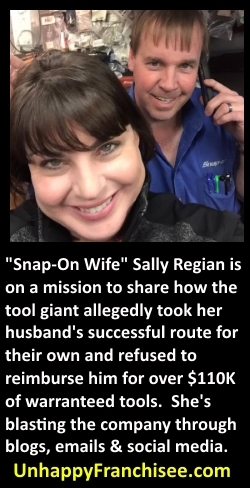 King & his wife Sally Regian are suing Snap-on for their alleged mistreatment and for sticking them with $110,000 (net) of tools they claim they should be reimbursed for. Sally Regian recently published a blog, a Facebook page and this letter, sent to Snap-on dealers, warning about Snap-on’s alleged mistreatment of successful franchisees. The Regian’s struggle with Snap-on is also featured on the tool dealer parody site Crap-on Tools. You would think as a top performing Snap-on dealer that you would not be abused by Snap-on? My name is Sally Regian. My husband, King, was an “award winning” top performing Snap-on dealer with a $27,626 per week paid sales average. He performed much better than the national average in both paid sales and collections. In 2015, his collections were $1,025,784.00! He was honored at the 2016 Kickoff by the President to Snap-on. This was 6 weeks after receiving his letter of non renewal. Everything was OK with Snap-on until my husband was advised at Snap-on’s own trade show, by a financial advisor, NOT to invest all of our money in Snap-on inventory but to turn in some of the inventory that we had been buying for years and financially diversify. We then began to return new stock and warranty items. That’s when all the trouble began. We sadly came to find out that Snap-on managers, in order not to have their bonuses reduced, routinely refused to take back inventory/warranty items on the bogus ground that King was buying Snap-on product off the internet. Nothing could have been further from the truth and, even if it was, Snap-on has an obligation to its customers to warranty broken tools. Up to that point there had been many years when King didn’t return new tools or submit warranty items for any tools. In August 2014, we were sent a letter detailing a “newly created return procedure” for especially for King to use when sending in warranties. This letter was a direct violation of the contract with Snap-on. The warranty process does not include the ridiculous procedure that Snap-on regional manager Mike Doweidt outlined. We tried on numerous occasions to compromise with Mr. Doweidt on the special “King Regian” return/warranty policy he instituted just to hurt us and keep his bonus from being decreased. King is currently in possession of over $110,000 worth – at net- of warranties. Even when Snap-on refused to honor their “LIFETIME Warranty”, King honored the warranty for his customers, with his own money, as that was the right thing to do. You should also know that upper Snap-on managers look to steal a successful route so they can re-sell it or in this case give it to a relative by forcing King out. On August 3, 2015, Warner McBride came back into the picture as our Sales Manager barely four (4) months after an April, 8, 2015 email King received from Thomas J. Kasbohm, Snap-on’s Director of Franchising congratulating King on the renewal of his contract. Shortly thereafter Mike Doweidt sent a letter of non-renewal for King’s contract. King loved being a Snap-on Tool franchisee and was an exceptional performing Snap-on dealer. He did what everyone said could not be done – running over one million dollars in sales and/or collections. He did that not only once but several times. It’s seems convenient that as soon as Snap-on saw that those numbers were attainable in the Waco market…he was removed and a COMPANY store took over. Is this how Snap-on treats its award winning dealers? Giving them a special Snap-on tool – a screwing? King is now an equally successful Cornwell dealer and will be filing a claim against Snap-on in an arbitration proceeding. We will also be bringing a court action on behalf of myself for the financial and emotional suffering that I have suffered. We have retained Gerald Marks, the attorney who has not only represented more Snap-on tool dealers than anyone else in the United States, to represent us but who also bettered the Snap-on system for all dealers when he got a $125 million dollar class action settlement against Snap-on for its wrongful actions against all dealers. I will let you know about other Snap-on wrongs in upcoming emails and in my blog (https://wordpress.com/page/formersnaponfranchisee.wordpress.com) that we have started. Just remember, if they did this to a top performing, award winning dealer, just think of how they will mistreat lesser performing dealers. Please pass this email on to as many dealers as you want to warn about Snap-on’s return and warranty abuse as well as its tactics to force successful dealers out just to get the successful route they worked years to build. ARE YOU FAMILIAR WITH THE SNAP-ON TOOLS FRANCHISE? DO YOU THINK SNAP-ON TOOLS TREATS FRANCHISEE DEALERS FAIRLY? I was a loyal snap on customer, along with many of my co workers, until this happened to King. King WAS the reason i even purchased snap on tools. When he left not only did I discontinue any purchases, but once my credit account is paid off I will wash my hands of this company.